Readers of Language Hat will know Jamessal, the writer James Salant. 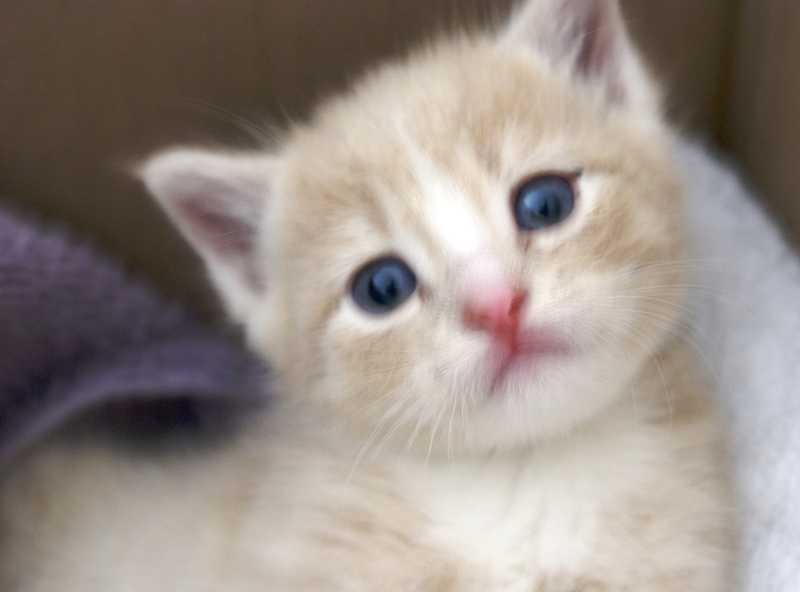 On Friday, Jim found this three- to four-week-old kitten sitting in the middle of the road. Update 20 May ’09: Muntz is now one pound, five ounces (0.6 kg). How can anyone resist that creature? least it’s nice to have clean sheets, Muntz pissed in our bed. Yes, but look how clean your apartment is. I may start calling you at three in the morning and asking if you’ve vacuumed under the sofa. Oh God. He’s adorable. Of course jamessal and Robin have to keep him. He has such a knowing little face. My cats are what Russians call “throw aways.” They got left at the doorstep of my wonderful cat food store, the owners of which sigh and take them in. And then I adopted them. I am a big believer in animals who appear in your life — you need to keep them because, well, they appeared in your life. Who are you to argue? I’d like to make it known that Muntz is joining our family and it’s because of Jim. He’s in love with the little guy and has put his foot down. He feeds him mashed up cat food out of a baby spoon and I just don’t think there’s any giving away after that. He complains, but with a kitten on his lap. I have a Yorkshire terrier on mine. Whereas you, Robin, would just as soon be rid of Muntz and you pleaded with Jim, ‘Take him away, take him away’. Glad you cleared that up. Heh. I guess I’m Dummkatz’ third owner. He was found under a bush in thunder and rain by my friends’ neighbours. My friends tried keeping him, but her allergies broke out again, so I ended up getting him. Luckily he ‘clicked’ with my neighbour’s cats immediately, so he’s been easy to keep entertained. He did piss on my bed, too, though. I’m still trying to figure out what to do when I get a job, since it’ll likely mean moving. Ah well – den tid, den sorg. I’m quite interested by the number of linguists who keep cats. It seems to go with the field, although Marie-Lucie would probably say it depends on which branch of linguistics you’re talking about (and what kind of cat). I’m not a linguist – in any sense of the word. I’m at best sesquilingual. Iono – Pullum is into parrots, isn’t he? I don’t imagine they go well with cats. Yes, that’s what most linguists seem to want to say. Well, it’s official — we’re keeping him. Thanks to Mab and Sili and Hat (and of course our host) for the encouragement and warm cat stories. You’re all linguists in my eyes. Keep them coming — we aim to be completely insufferable. Update 20 May ‘09: Muntz is now one pound, five ounces (0.6 kg). He’s also taken to attacking my shoes and, when brave, Champ. Oops, I linked the Google search rather than the site. On the other hand, it’s rather interesting that there are 16,400 google hits for mingus toilet. I wonder if Mingus was good at maths and liked comics? Having read it, I can’t see how I could get this to work for goats. It’s too bad, because I would love to have them in the house.